Our home at “Tall Trees Lane” has just 3 1/2 weeks left and then we close and move in. I hate to say that out loud, in fear that something happens but it’s soooooo exciting! I stopped by the house yesterday and I got emotional. It’s starting to look like an actual home. I can’t wait to move in and share it all with you! But for now, I’m sharing the perfect interior paint color that I picked and sharing a house sneak peek with you. Oh, and please excuse the iPhone pictures but I didn’t bring my nice camera. If you follow me on Instagram @SummerAdamsDesigns you may have seen the sneak peak I shared on my stories. I tried many samples and put them on boards and looked at them at all different lights during different times of the day. I hoped I’d love it but you just never know until it’s done and you see it. Walls are Gray Owl at 50% and the trim is Ultra White, both by Benjamin Moore. Gray Owl is a pretty color but darker than I wanted. But at 50% it is PERFECT! I saw this picture below from another blogger and thought it was gorgeous. 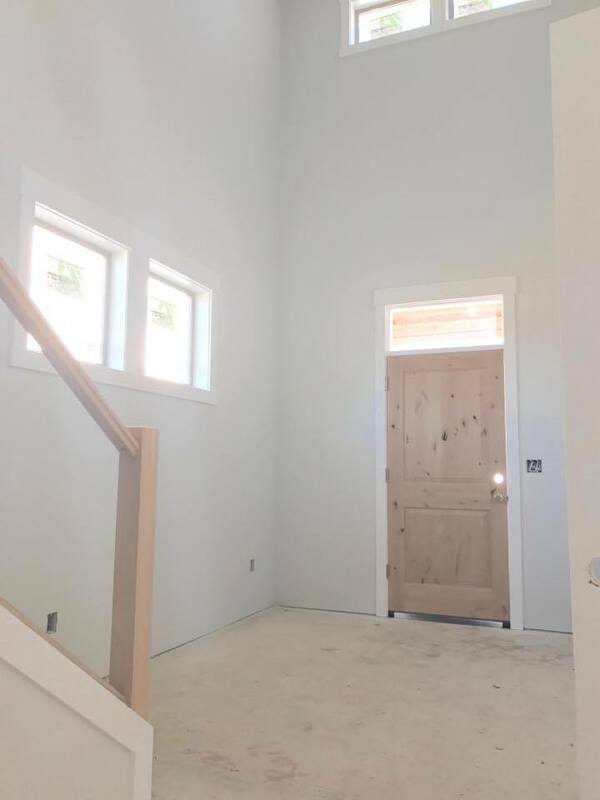 I wanted to do white walls and white trim, everything white! Josh wasn’t too keen on the idea until I showed him lots of examples. Then he was on board. However, I wanted a white that had just a tinge of grey in it so that you can see a slight difference when next to the super duper white trim. I originally wanted Paper White but it was too close to my trim. Gray Owl was pretty but too dark. But when I saw this pic by Cozy Cottage Cute…it was exactly what I wanted! It looks white when it’s wet and looks white grayish-white when it’s dry. But when you see where it meets the Ultra White trim, you can see that tinge of gray and it’s only a subtle difference. But looking at it when entering a room, you think the room is painted white. And because I know y’all will ask….No, it doesn’t look slightly purple or green or blue. It’s the perfect interior paint! I tried it in sunny weather and on cloudy days, inside and outside and at different times of the day. In our downstairs living area, the built-ins were dropped off and so was the fireplace mantel. I love it so much! I designed this with our cabinetry guy to have a French/Coastal look. 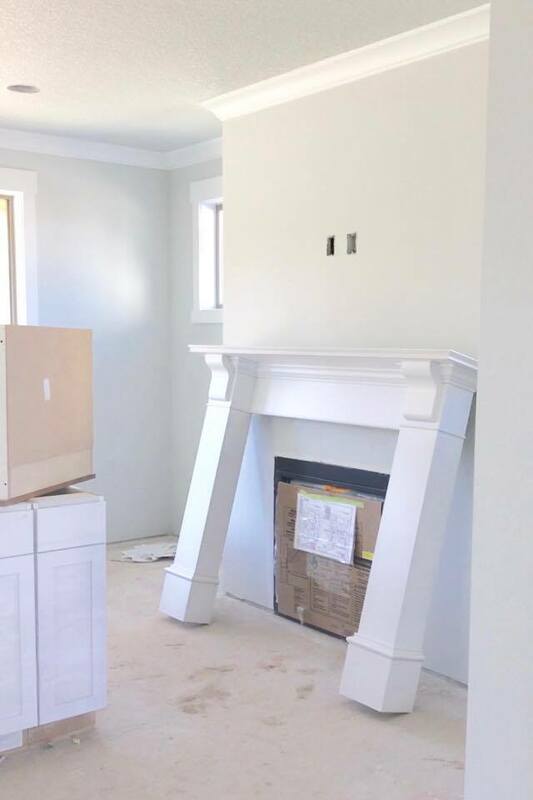 It’s called a French mantel without an arch. I didn’t want any arches in the house. It will, however, have marble around the face of the fireplace. I want a very french/coastal/glam feel in this home. The door will be stained in the entry and I’m waiting on the perfect chandelier. I looked for months and when I finally saw the one I chose, I knew it was “the one”. I can’t wait to show it to you!!! I love the 2-story entry and the stair case will be gorgeous when it’s done. I’m so grateful for the windows, as we are in the Pacific Northwest and need all the natural light we can get during the grey overcast months. Here’s a little preview of my flooring as well. I’m using this gorgeous bleached wood laminate by Pemberton in “Sand Maple” from Cascade Flooring here in Vancouver, Washington. And I upgraded our carpet to this beautiful light short shag carpet. I don’t remember the name of it. But it is stain resistant and I love that it matches the laminate perfectly. I’ll update when I meet up with the flooring people next week and it goes in so make sure and check back. The top of the hand railing on the stairs will be stained wood to match the laminate flooring. 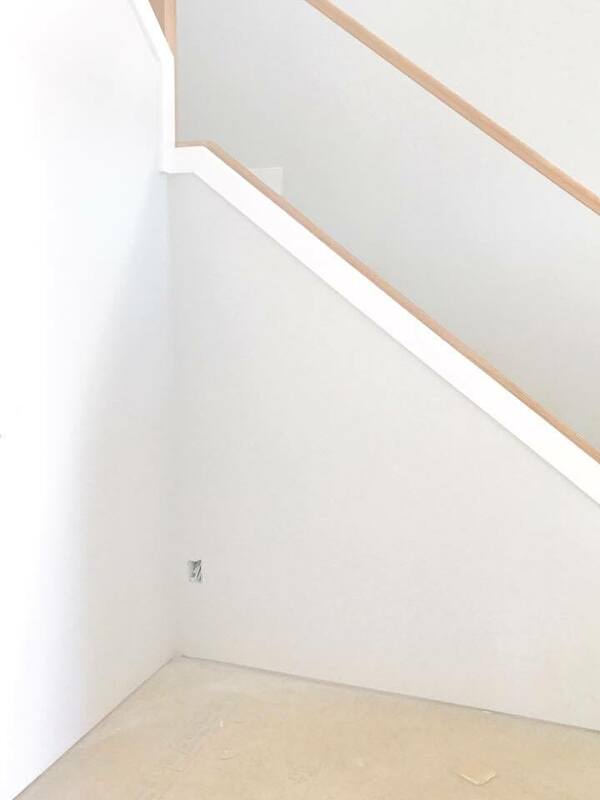 The rest of the staircase will be white. Can’t wait to show you! All the hardware has arrived and it’s perfect. I love it all. Lighting is showing up as well so stay tuned because I’ll be sharing sneak peeks on my Instagram stories! Thanks so much for stopping by! I’m so glad I could share the fun with you! That is seriously the perfect gray!!! Which is suuuuper hard to find. Love!! It’s like Christmas x 200!!!!! I love the color! !! How exciting!!!!! Your new home is going to be as glamorous as you. What fun you are having! Thank you so much my friend! I love the flooring so much! I knew it was “the one” as soon as I saw it, same with this paint! And same with my husband Hahaha! I think he might have been the one to recommend this color to me? Was it you that used it in your master bath? I love white white white everywhere!!! It is looking so good Summer! I’m so happy for you! Kellie, thank you! Josh was nervous about it at first but he found love with all of the white. Plus, here in the PNW we have months of gray skies and rainy days. I really think this is going to help, along with all of the windows in this house. So glad you could stop by and tell me what you think! Thanks so much again! Beautiful and soooo refreshing! Luv white and light neutral colors too. I’ve used Paper White as well and it’s great! Glad it looks perfect in your house! I’m super excited for you Summer! It’s all looking so gorge!! Can’t wait to see more!! I love your choice for the laminate and think your house is going to be amazing! 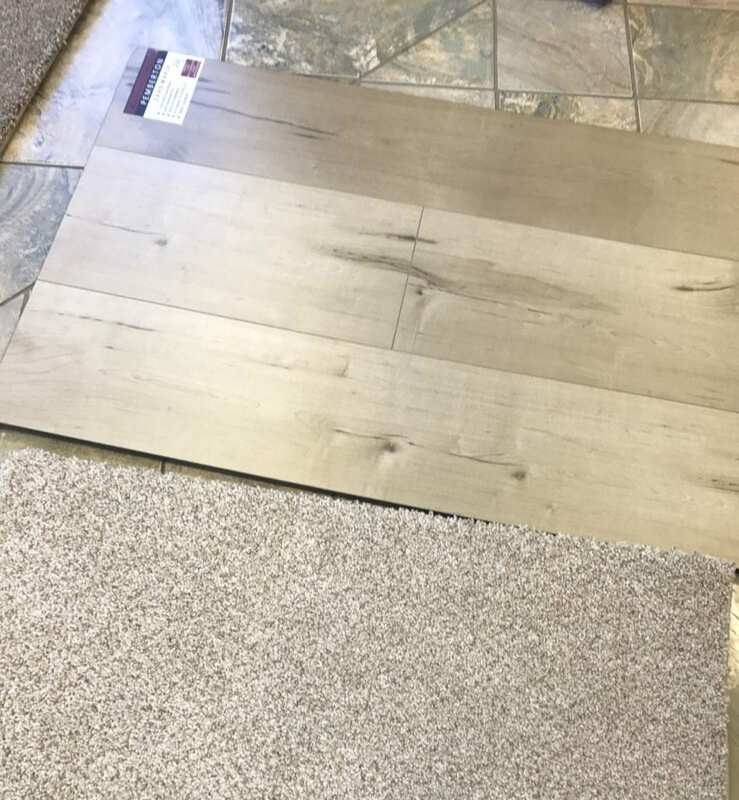 My b-i-l is putting new flooring in his home in Coeur d’Alene, ID, but he can’t decide what to put in. I’m going to tell him about Cascade, because they have a location in Spokane. We just moved into a new house in Atlanta and it has beige walls everywhere. I’ve been debating what color to paint (BM Gray Owl, Paperwhite….) and after seeing your pictures I am going to go with Paperwhite! Gorgeous. It has the perfect amount of gray in it! Thank you for the inspiration! Hi I just came across your blog for the first time while looking for laminate flooring pics on Pinterest, I’ve had a hard time finding anything I like but I LOVE the sand maple you’ve chosen for your house! Can’t wait to see pictures when it’s all done! I love following you! This year we are redoing our bedroom and I love the color you have choose. I tried looking it up but it doesn’t show up on the website for Benjamin Moore . Do you have a number for that color? Thanks! I ABSOLUTELY LOVE your home! Thank you for sharing it with us all! – You have inspired me to go with Grey Owl and Ultra White. I have so many samples on my walls now, but I’m ultimately going with your same colors! Do you mind sharing the BM sheen you used in the bathroom walls and throughout, please? I’m debating on the Aura, but used it in my other bathroom and wasn’t thrilled with it =( My project is happening this weekend and I am very excited!! =))) Thank you again, for ALL your inspiration!! I love your selections. I have been searching for acrylic and brass drawer pulls for our master bath reno. How have yours held up? I ran across those on Amazon and I was nervous because they are such a great deal. I hope they will stand the test of time!